If there’s ever a video to perfectly sum up learning life lessons the hard way, this is it. Though we all learn new things everyday, there are a few moments in everyone’s life which are looked back on as big lessons. They’re the ones you remember, the ones which alter your perception of the world around you, and make you start to question things you once believed were sacrosanct. There are some things we shouldn’t need to be told not to eat such as, oh I don’t, poisonous laundry detergent, for example. But then, some things do look delicious, and the more you look at them, the more you wonder why you shouldn’t eat it. Like cocoa powder. It’s chocolate which can be eaten by the spoonful, right? The look on the boy’s face as his world comes crashing down around him is heartbreaking, priceless and hilarious all at the same time. Life lessons can hit you hard. 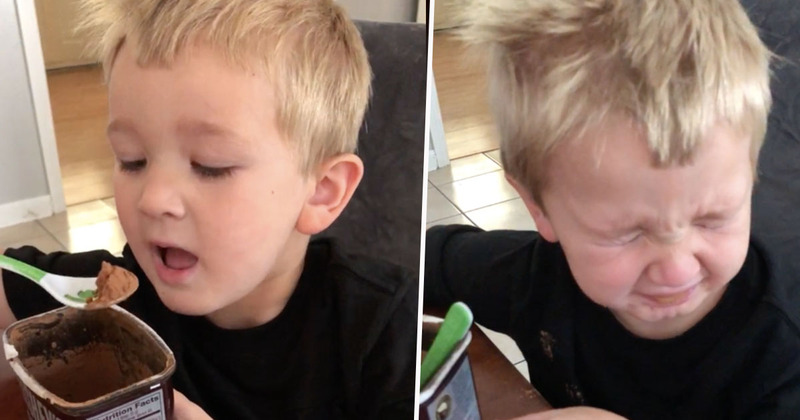 The strong-willed boy, named Gabriel, is probably too young to remember the cinnamon challenge, so isn’t aware of the risks of filling your mouth with a moisture-sapping powder. Nor is he aware cocoa powder isn’t exactly chocolate in powdered form, but I can totally see where he’s coming from. I bake all of the time and he watched me make brownies with the cocoa days before the video was filmed. In his mind it was going to be nothing less than delicious. I kept telling him to stop climbing on the counter and that the cocoa does not taste good. After days of begging to try the powder, Stephanie understandably, or perhaps controversially, decided to let little Gabriel figure out the cocoa conundrum the hard way. I knew it wouldn’t harm him because I ate a heaping tablespoon of it as a kid thinking it would taste like Ovaltine. After the video was filmed I washed his mouth out with water and gave him something to drink and he went on playing until his breakfast was ready. Like mother like son! I must admit, I’ve been in Gabriel’s situation and often fight the urge to just shovel coffee grounds into my mouth rather than wait for them to brew. But why are we often tempted to try foods that definitely aren’t foods, or at least things that shouldn’t be consumed as food? As for cocoa powder and cinnamon, you may just really like those flavours, or are really hungry? But as clouds of dry dust are coughed up, they shouldn’t really be eaten on their own. And as for the ridiculous Tide Pod challenge, there may actually be some science behind it. No, not because people want to poison themselves but, as a study published in the Journal of Consumer Psychology points out, humans are inherently drawn to glossy items, which stems from the desire for water as a resource. It shouldn’t need saying again, but don’t eat Tide Pods. If you have to, go for cocoa. Or just make yourself a sandwich.